Deuce died today from liver failure probably caused by a problem with his bile duct or gall bladder. He was just shy of fourteen years old and was a very healthy dog except for a having a toe removed a few months ago due to a slow growing tumor and an incident a couple years ago where he somehow managed to break his tail (!?). 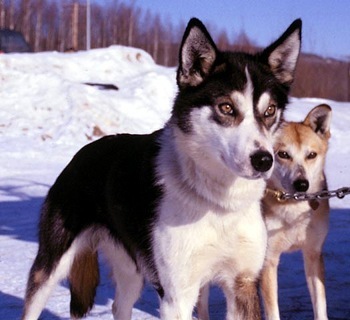 Dusenberg (he came from a litter named after luxury cars) was our first sled dog and our second dog after Nika. He was a tall, gorgeous looking husky with a great coat and very upright and alert ears. We got him in the fall of 2001 when he was four years old, and despite his many quirks, he was a great dog once you learned how to handle him so he felt comfortable. He was an outdoor dog for the first six years we had him, coming inside only for food. Whenever we’d try to keep him in the house beyond dinnertime he’d pace back and forth until we let him out again. Then, suddenly, in December 2007, he decided that being in the house was OK. It took several more months before he learned to lay on a dog bed instead of the floor, and by the end of his life, he actually preferred being in the house, curled up on a dog bed. After his foot surgery, he stayed inside every night, and often during the day while we were at work. He was a very sweet dog, and the only one in our yard that would run away from a fight instead of trying to get involved in it. Whenever I’d clean the dog yard, he would follow close behind me, patiently waiting for me to turn around and pet his head. And in the last year, he enjoyed playing with the kittens, pawing at them and pulling them around on the floor (video at the bottom). Every morning when I came down the stairs, there’d be Deuce curled up on a dog bed (he was afraid of going up the stairs). Tomorrow morning will be hard, not seeing his furry ears and bright face looking at me as I come down the stairs. Rest in peace Mr. Deuce. We love you. I’ve read a lot of Ian McEwan over the years, and it’s impressive how different his stories are, and how precise and well written they are. On Chesil Beach is a horror of a story where a single moment is fully visualized and expertly drawn, and when it, ahem, comes, you know that things will never be the same for the characters. I guess this is McEwan’s expertise: visualizing characters suddenly drawn into situations so far from their expectation that you never quite know how they will react. In this case, one wonders if the outcome of the story would be different if the time or place were different? I should hope that a more modern sensibility, more open dialog about intimacy, perhaps even premarital sexual investigation, would prevent the sort of misunderstanding that’s at the center of this book. No one can unpack a single frozen moment better than McEwan. Last night a pair of young moose showed up in our driveway. Andrea and I went out on the deck and shot some iPhone video of their antics. At one point (see the video below) Deuce went over to the fence and the moose ran over to check him out. It was clear that Deuce was trying to play, but I’m not sure what the moose were thinking. The iPhone shoots QuickTime movies; the new HTML5 web standard will include a video tag that indicates to a browser that the file is a video. Firefox 3.5 is the first browser to implement this tag, playing Ogg Theora videos without needing an external video plug-in like Flash or Silverlight or whatever. This is a good thing because it means web developers can stop developing their sites with a bunch of proprietary languages and formats just to show a video. Unfortunately, getting a QuickTime video from the iPhone into the right format is a bit of a pain, and even after I got it all figured out, the video wouldn’t play once I uploaded it to my hosting provider. But in case it’s useful, here’s the procedure I used. I suspect the ffmpeg2theora step could probably have been done on my Mac, but it doesn’t appear to be part of fink so I just installed it on my Linux box and ran it there. 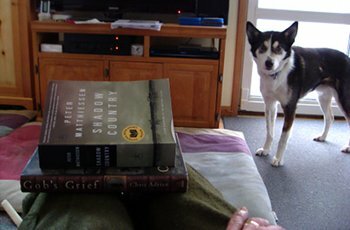 I just finished a pair of books that take place around the time of the Civil War and the years following. Both stories are told from multiple points of view, but the similarities end there. 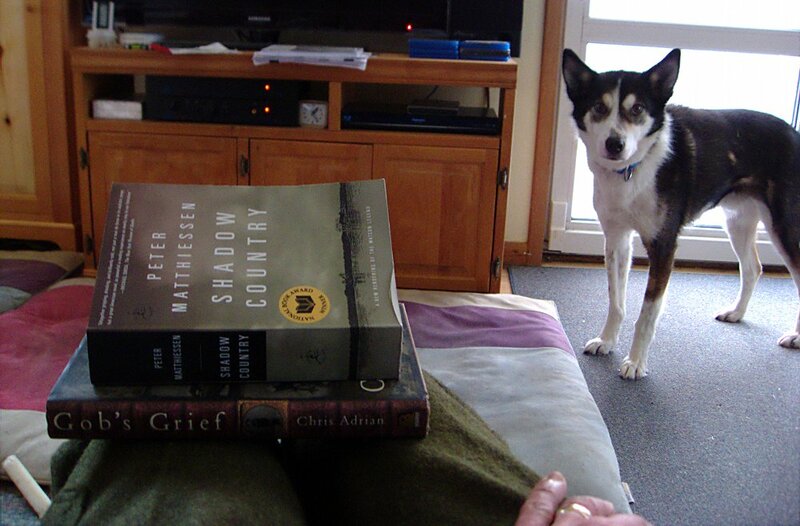 Peter Matthiessen’s masterwork of fiction Shadow Country is a reworking of a book he wrote decades earlier, and which was originally split into three separate books. It tells the story of “Bloody Watson,” a real person who was suspected of a multitude of murders in southern Florida and who was gunned down by his neighbors after the great hurricane of October 1910. The first “book” is composed of a series of short chapters written in the voices of the people who were present when Watson was murdered, the second is from the perspective of his son, and the third is a first person accounting by Edgar Watson himself. It’s a great way to tell a story, not only because each section comes from a different perspective, but because each “author” lived a very different part of the same history. The accounts overlap, of course, but in ways that draw you into the mystery of Watson’s life and his family rather than simply telling the same tale from different angles. For such a long book, it held my attention throughout, and involved places and times I’m really not all that familiar with. And knowing what little I do know about the Everglades region of Florida, it’s likely that there’s nothing left of the world Watson lived in. Most of that is a good thing—the relationship between the races and sexes was harsh and brutal—but it would be great to see what the Everglades looked like before much of the wildlife was shot out and the structure of the region was changed. The second book I read this month is Chris Adrian’s first novel, Gob’s Grief. I read The Children’s Hospital in 2007, and came away wanting to read more from Adrian. Gob’s Grief isn’t as spectacular as The Children’s Hospital, but it covers a lot of the same ground; angels, spirits, life and death. And just like The Children’s Hospital, he somehow manages to keep the story grounded in reality. A couple asides: the dog in the photo is Deuce, who finally figured out (last month) that sleeping on dog beds was better than sleeping on the floor. I tried setting the books next to him laying on a dog bed, but he couldn’t handle that. So that’s the best photo I could get with him and the books in it. Nika is out in the dog yard and the other dogs are at the races with Andrea today. The weather is turning toward spring: there’s water on the Creek, the snow is melting away, and every day it seems like the days are noticeably longer. The sled dogs always go a bit crazy at this time of year because the dog yard is still covered with snow, but their racing season is over. 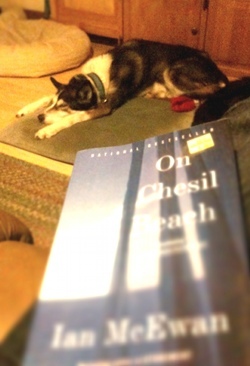 This appears to have affected Deuce more than the other sled dogs. He’s always played with “his” food bowl in the dog yard, but in the last few days he’s started picking up the dog bowls in the house and carrying them around. 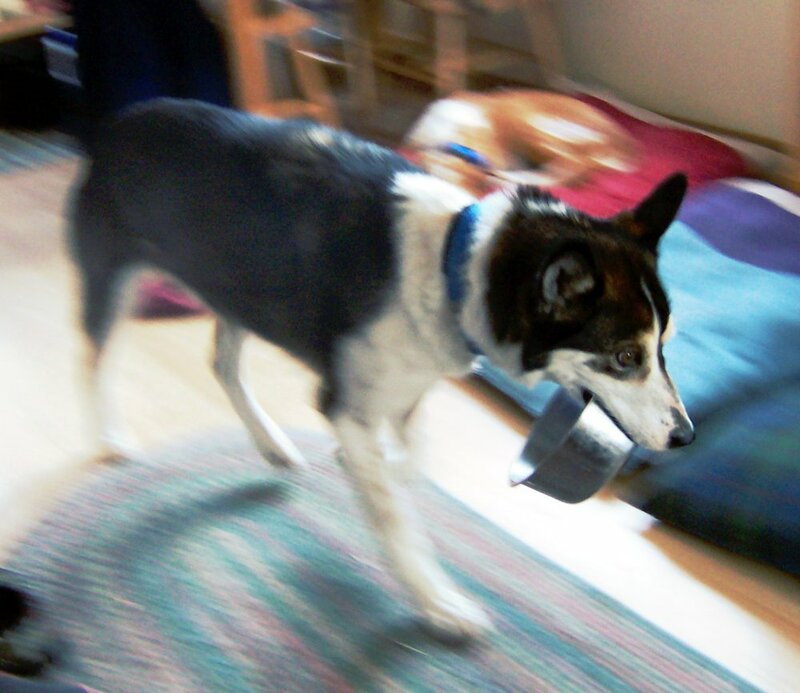 The photo shows him pacing back and forth in front of the couch with one of the bowls. It’s very cute. Hopefully once the snow melts and we can spread the wood chips around again, they’ll get into lazy summer mode and Deuce will relax.